So you’re looking for a quality vintage strap for your Panerai. We have all done the search online and everyone seems to have a swiss ammo pouch strap that you should buy. But in this niche market there are a few names that stand out above the rest, some of which I have interviewed and reviewed right here at Panerai Central. Another name that belongs on the short list of über quality straps is the one and only Ted Su. I have heard about his straps for a long time and was given the privilege to review a few of his straps for the site. The first strap that is up for review is an amazing swiss ammo pouch strap from his collection. 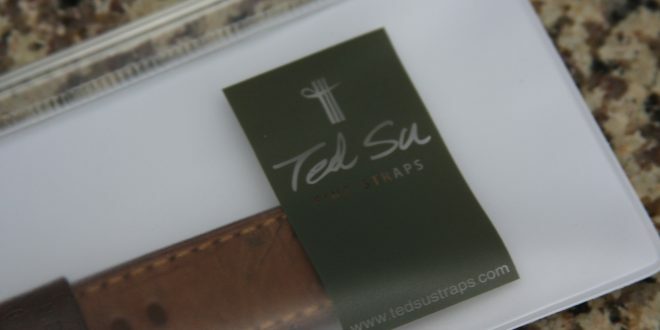 Ted Su sends his straps nicely packaged in a ziplock style baggy with his motto “Where innovation and craftsmanship meets”, which is a nice way to begin your journey with a new strap. When you first look at this strap you will notice two distinct colors that makes up this strap. Near the lugs it is a lighter brown shade while the rest of the strap is a darker brown. Taking a closer look at the lug area you will notice some interesting holes that might have been from the original stitching of the ammo pouch. It gives the strap some serious character to say the least. The lower half has amazing patina and aging throughout ranging from darker browns to black stains. You can only imagine the life that this leather has gone through before it has reached its final destination in my hands. The actual strap is a two layer design that measures 4mm thick all the way through. It has a single keeper that is 22mm thick and has a stamping of the original ammo strap with the date on it which gives it a perfect finish. Personally feel that with an Ammo strap the only way to go is with a single thick keeper such as this one. This particular one is dated 1968 but Ted Su has a variety of ages and styles when it comes to these ammo straps. I will speak to that a bit more in the conclusion of this review. The underside of the strap is a very smooth brown leather that rivals the OEM straps in every way. He has stamped his signature on the lug side of the tail end and even went on to customize the strap by stamping in “Panerai Central” at the end of the strap which was a unexpected surprise. The holes are punched with amazing precision from top to bottom. The edges of the strap are left as is with no wax added. That’s not to say that the edges or rough or fraying by any means. Ted has taken the time to grind the edges so perfectly that they are smooth to the touch. Moving on to the stitching the strap features a nice honey brown thread that blends in nicely with the color of this strap while adding just a hint of contrast that is easily noticed. In the past I have seen highly contrasted threads used with these ammo straps which completely take away from the elegance of the vintage look these straps can provide. Want to know why the thread looks so amazing? Maybe it’s because it’s the same German thread that is used to stitch the interiors of Porsches. The stitching is done with such precision that you immediately know the quality is top notch. When looking at the stitching on the back of the strap you will notice a completely different finish to the top part where the lugs are. Usually most strap makers will finish off one side with a knot of some kind but Ted Su decides to do a variation that I have never seen before. It’s hard to explain but you can easily see it in the pictures below. Here some more info on this Ted Su signature piece direct from him. The twisted thread was inspired by the vintage Swiss ammo pouches. Back in the world wars, the ammo pouches must be in big demand, but they are still mostly handmade. In order save time for mass production, the makers used this technique when they need to stitch two lines of stitches they are close to each other. Instead of cutting off the thread and re-needle the tread, they use this technique to jump from one line of stitching to another. We used this style as one of the Ted Su identities and also for function. Function, when a strap is worn for long period of time, the lining is likely to peel off at the lug ends. The twisted thread “presses” the lining against the ammo leather for longevity. The attention to detail is even evident when you take a look at the keeper itself. On the underside of the keeper they could have gone the normal route and just did a normal stitch but instead Ted decided to create a tail like finish when it wraps around with a circular stitch pattern to hold it all in place. Little things like that truly give it another dimension It might seem something so simple to the everyday person but to a watch fanatic such as myself it gives it that step up from the norm. The buckle on this strap is a modified Pre-V style that is much thicker than other straps out there and is pretty much on par with some of the buckles I have seen from Rob Montana of The Strap Smith. It’s 4mm thick which works nicely with the strap since it is very uniform all the way through. The strap is pretty soft right off the bat but will need a just a bit of wrist time to get it to the point where I will totally feel like I’m not wearing anything on my wrist. In no means is this strap stiff but a bit of breaking in will go a long way with this Ted Su strap. With the underside of the strap being so beautifully put together I am sure I will be able to wear it all day without issue. Taking a quick look at this strap you can tell that Ted takes price in a quality build. He takes his craft very seriously which definitely shows in the end product. When you see a custom strap with this type of build you know right off the bat that it is going to last a long time. I can’t wait to see how this strap will look after years or aging and added patina. There aren’t enough adjectives to describe how much I really like this strap. It has everything one is looking for when trying to buy an ammo strap. What’s even better is that you have so many choices when it comes to an Ammo Strap from Ted Su. You have a couple of choices which are going to be the Signature Collection and the Ultimate Collection. The current one I reviewed is the Signature collection which is guaranteed with one stamp somewhere on the strap. Of course each one is completely different so you can choose which one you want at the end of the day and where you want the stamp located. The prices on the Signature series run from $200 – $260 depending on the age of the ammo strap. The Ultimate collection features two stamps on the strap as compared to the single on the Signature Series. These straps range from $400 all the way up to $500 depending on the age. If you really want to be unique and have a one of a kind piece, then you can opt in for the $1000.00 triple stamped piece that is dated 1903,1906, and 1912. If you are in the market for something slightly less you can always order a custom made ammo strap with no stamps for around $200. You can buy anyone of his pre-made ammo straps in the standard sizes or get a custom made one to any length and dimension.